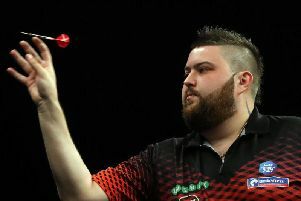 Michael Smith is through to the second stage of the Unibet Premier Darts League ... by the skin of his teeth. But his 7-5 victory over the Welshman gave him two crucial points which left five-times world champion Raymond van Barneveld, who lost the last game of the evening to Irishman Daryl Gurney, being shown the exit door with one round still remaining. 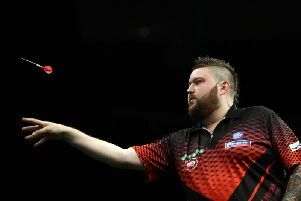 Smith, who reached last year's final, had his fans on tenterhooks when his opponent missed two darts at a double, which would have earned him a 6-6 draw, but Bully Boy lived up to his nickname by ending the match in sensational style, pinning the bull with his last dart in hand to complete a 90 finish. The St Helens ace said: ''I'm chuffed at winning but could so easily have lost the match. ''I haven't been in the best of form in the last few weeks but I'm still fighting. "It was also my son's fifth birthday and I wanted to win the game for him. Maybe I tried too hard in those circumstances but I eventually got the win and that is all that matters." Smith goes into his final game before the play-offs tonight (Thursday) when he faces James Wade and, ironically, 24 hours after the possibility of elimination a win could elevate into the top four.